In-house programs for children K-2nd grade and traveling program for grades 3rd-8th. Boys, Girls and Co-Ed Teams. We start our program as early as 5 years old. Get your kids involved in sports early and teach them to love this game! The PYSA shall teach good sportsmanship, leadership, and teamwork skills, educate participants and adults in the fundamentals of the game of soccer, promote the game of soccer through sponsorship of regularly scheduled soccer competition and special soccer events, and conduct such other educational activities as are deemed appropriate to the promotion of youth soccer activities. Click on a team to go to their individual calendar page. Don’t miss important information. 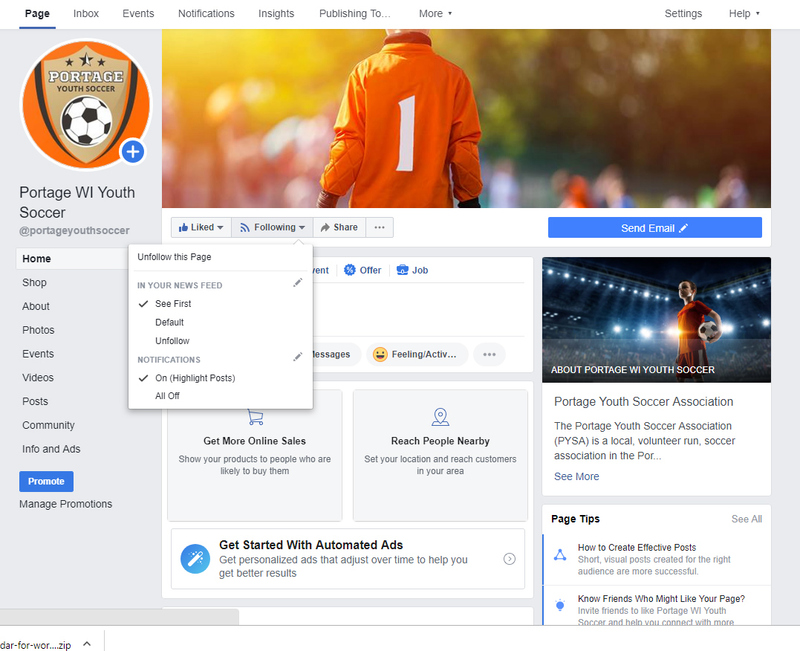 Stay on top of current events by Liking our Facebook page and by changing settings to view Portage Youth Soccer posts first in your feed. U6-U8 program begins tonight!! If you were not able to make family night we will have shirts available for your child. Please don’t forget shin guard and tennis shoes! If you have not received an email from our Program Manager Amanda Larson, please let someone know tonight. We are receiving several notices of wrong emails and delivery failures. The Portage Youth Soccer Association (PYSA) is a local, volunteer run, soccer association in the Portage area. We currently have an in-house program for children K-2nd grade and a traveling program for grades 3rd-8th. The PYSA organizes teams, offers coaching clinics and soccer camps, raises money for uniforms and equipment and along with Portage Parks and Recreation, maintains and schedules the soccer fields. Our parent organization is Madison Area Youth Soccer Association (MAYSA). We have many volunteer opportunities available. We need YOUR help to keep organized soccer in Portage. Thank you for visiting our site!